At Premier Physician Marketing we are a small, tightly-knit and highly-specialized group of people who are the "best-of-the-best" in our respective fields. We are not the biggest medical marketing agency, but we are the most specialized — offering the most comprehensive clinical marketing services to leading aesthetic physicians. Our Digital Marketing Director co-authored the best-selling book on Google Adwords. Our founder worked with billionaire entrepreneur Kathy Ireland (who praised her business insight and mentorship abilities.) Our Creative Director has worked as one of the top creative minds at a prestigious Madison Avenue ad agency, and our Head Publicist is nicknamed "Mr Hollywood", having worked with celebrities like Snoop Dogg, Gwyneth Paltrow, Elon Musk and acclaimed physicist, Stephen Hawking. We are not a Goliath-sized marketing agency, and we are certainly not for everyone. Our goal is not to be the biggest, just the best. That's why we choose to work with a smaller number of the best physicians in America as their own top-gun marketing team, giving them unparalleled attention, service and measurable results. Julie Guest is one of America's most highly-paid and sought-after strategic marketing consultants. 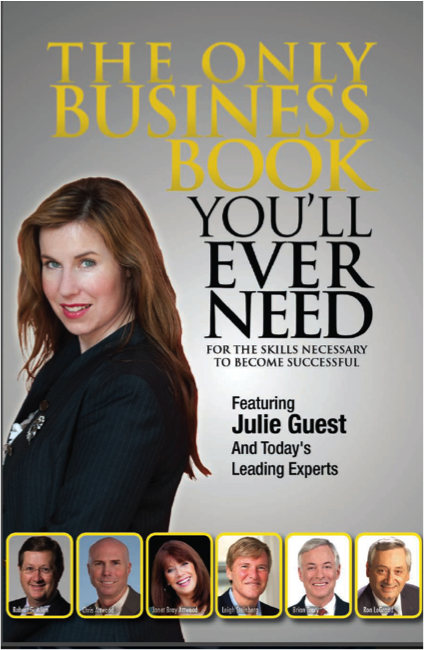 Julie is also a best-selling author and popular speaker. She is the founder of Premier Physician Marketing (her third marketing agency) and has worked with hundreds of entrepreneurially-minded physicians and successful businesses that have included Fortune 500 clients, such as Microsoft, and entrepreneurial enterprises with revenues exceeding $30 million. In 2012, Julie co-authored a best-selling book with renowned motivational speaker, Brian Tracy, called "The Only Business Book You'll Ever Need", and was also awarded the Editor's Best Choice Award for her contribution. She was inducted into the Academy of Best-Selling Authors and has been featured in a variety of media, including, ABC, CBS, The San Francisco Chronicle, The Miami Herald, USA Today and many others. In December 2014, Julie released her newest marketing book written especially for doctors in aesthetic medicine, entitled "67 Marketing Secrets to Ethically Attract New Patients, Make More Money and Grow Your Practice." Her most recent article has been published in the Aesthetic Surgery Journal (March 2015 "How To Market to Women"). Julie was born in South Africa, raised in New Zealand and moved to America in 2005. She is an intrepid adventurer. She has sailed across the Atlantic on a 45-foot catamaran from Capetown, South Africa to St. Lucia in the Caribbean; swam in a mud volcano in Colombia; bungy jumped over the Zambezi River in Zimbabwe; went scuba diving with seals in South Africa; taught skiing at Whistler, Canada; and, most recently, made a "Bucket List" trip to Cuba with her camera.